Kleon McPherson, Director of the Spoken Word video, Back in Times..
Kleon McPherson, Director of the Spoken Word video, Back in Times, has added the Barbados Independent Film Festival prestigious Carmichael Award for Exceptional Storytelling to his list of honours. 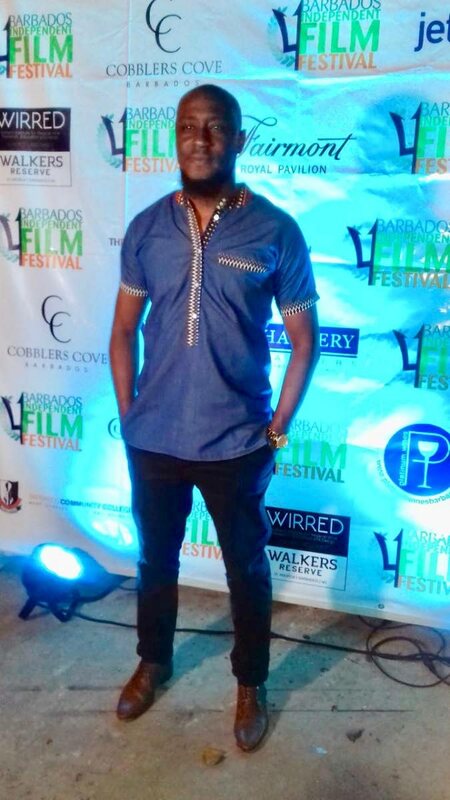 The film festival was held on 11-20 with a premiere of the four-minute video, Back in Times, at the Walled Garden Theatre, Barbados on January 19. In an interview with Newsday Tobago, McPherson said he was surprised and honoured to win such a respected award. “I feel very proud and humbled to win such a prestigious award, taking into account that last year, Green Days by the River won that award. So, to be even be within that same category of great films is a good thing. “As well, I am very proud that certain elements of Tobago’s culture are on display and individuals with a vast number of talents are also highlighted,” he said. McPherson introduced the four-minute video production Back in Times, done in Spoken Word format to the TT Film Festival with a premiere at Movie Towne, Gulf City mall, Lowlands, last September. He had said that the video was to give exposure for Spoken Word artistes, himself included, as well as Tobago. “Basically, the film draws a start contrast of how things were and how things are now. It’s more a reflective piece showing how things have developed over time and appreciation for the simple things. It pays homage to certain cultural icons and certain individuals that would have changed the course of history within Trinidad and Tobago,” he said last week. “It also touches on various social issues and different aspects within Trinidad and Tobago culture and within the settings of Tobago within itself,” he added. Back in Times has also being selected for other Caribbean film festivals as well as internationally. Meanwhile McPherson continues conducting workshops throughout the Caribbean for students. “I recently did some Spoken Word workshops in Barbados at various secondary schools. It was well received. Later this year I am supposed to do some workshops in St Vincent at various schools as well,” he said. McPherson’s entry into the Spoken Word industry started some seven years ago when “a guy asked me to perform at a Spoken Word event. “I performed and realised that with the feedback I was getting, I was on to something. The rest is history from there,” he said. Reply to "Kleon picks up prestigious Carmichael Award"